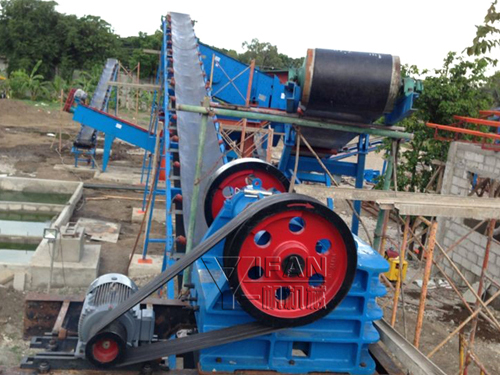 River pebbles sand production line which consists of the following machines: vibrating feeder, jaw crusher, vertical shaft impact crusher, vibrating screen, tape machines and other equipment, is a combination of transmission. First, river gravel from the hopper to the feeder, the feeder part of the screen is slightly out of small river pebbles by the belt to the transition hopper, a large river pebbles to coarse jaw crusher, after breaking Transition to the hopper, the material at this time the transition hopper more evenly, these materials into the crusher and then fine-breaking, after screening the material through vibrating screen, the larger material back crusher further broken By vibrating sieve out the fine material into the third generation of Sand for sand, the sand slightly larger after the return of materials Sand for sand, fine materials, finished products from the shaker screen sand. 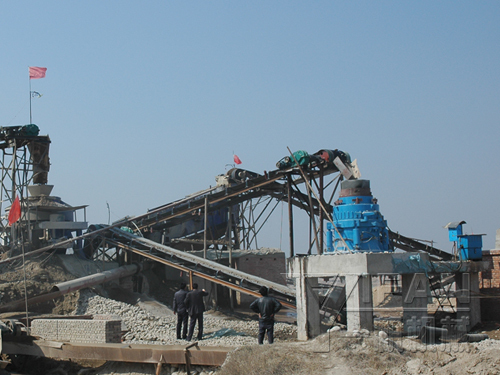 So far, the river pebble sand production line and rock production line from YIFAN have been very popular both at home and abroad. And the products of YIFAN have exported to Oman, New Zealand, Philippines, Russia, Malaysia, Vietnam and other countries. What’s more, YIFAN will offer our clients the most patient and considerate pre-sale, sale and after-sale service, so the products are widely trusted by the clients all over the world.